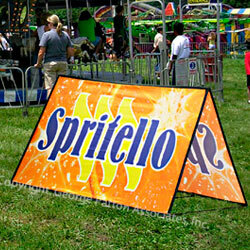 Banner Size: 78" x 38"
This banner flag communicates brands, logos or messages to prospective customers. The outdoor displays are perfect for sports games, like golf or soccer tournaments, road races or volleyball competitions. 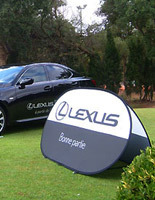 The banner flag, also known as a portable popup pennant, is an excellent way for corporate sponsors to "get their name out there." Car shows and community fairs are another place to find these unique advertising tools. 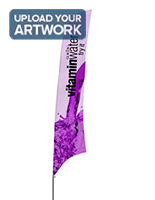 The banner flag is also useful indoors, at tradeshows or conventions. 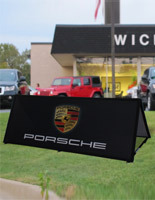 Wherever a business is looking to advertise, these pop-up signs are an effective and economical choice! 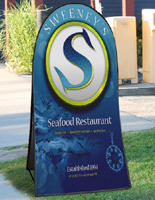 This collapsible advertiser, banner flag includes full color, digital printing, so customers can design completely individual, eye-catching ads, without color or graphic restrictions. 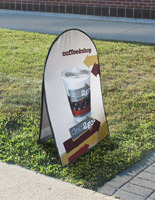 The popups feature weatherproof mesh polyester with flexible fiberglass poles within black polyester sleeves. Hook and loop distancing straps keep the pennants properly displayed and also provide an area to place weighted bags (water or sand) when the structures are used on hard surfaces, like sidewalks, driveways or artificial turf. Included galvanized steel stakes pushed through steel ring secure the A-frame to softer surfaces, such as sand, grass, snow or soil, for stability and weather-resistance. No securing mechanisms are needed when the banner flags are used indoors. These promotional signage solutions fold down to fit into a 41-3/8" x 35-1/2" bag, and can be set up in mere seconds! 78.5" x 38.0" x 29.5"
41.4" x 35.5" x 1.0"